The S&P 500 Is Going To Decline Lower? 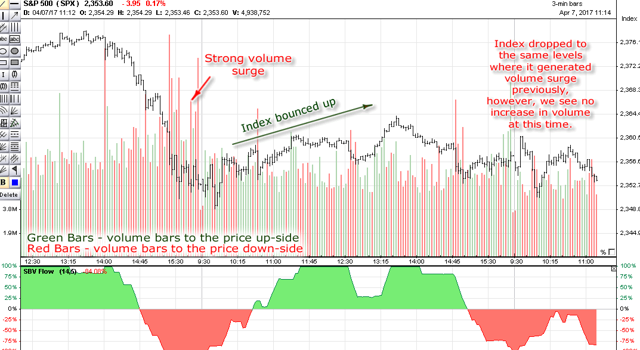 where we called for a bounce up after a strong volume surge at the second half of trading session on Wednesday, April 5 of 2017 - see 3-minute S&P 500 volume chart. As we mentioned before, on that day (April 5, 2017) the Bulls entered the market and they stopped the decline. On the next trading session (April 6, 2017), the S&P 500 index bounced up. However, the bounce was not very strong and the index has been moving side-way since them. - the decline on 4/5/2017 attracted the Bulls to buy - we saw increase in volume. - the index cannot drop lower when Bulls are jumping in. - now, after some side-way trading the enthusiasm of the Bulls halted - they are not buying madly any more - no increase in volume. - now the index may drop lower - the Bulls are not going to resist a decline if it occurs. - the S&P 500 may now slid lower until it runs into another volume surge - when Bulls start buying again. Important: this is intraday analysis of the S&P 500 volume. This has nothing to do with mid- and long-term S&P 500 trend. Analysis on this level may show the most possible trend development over the next couple of days only.